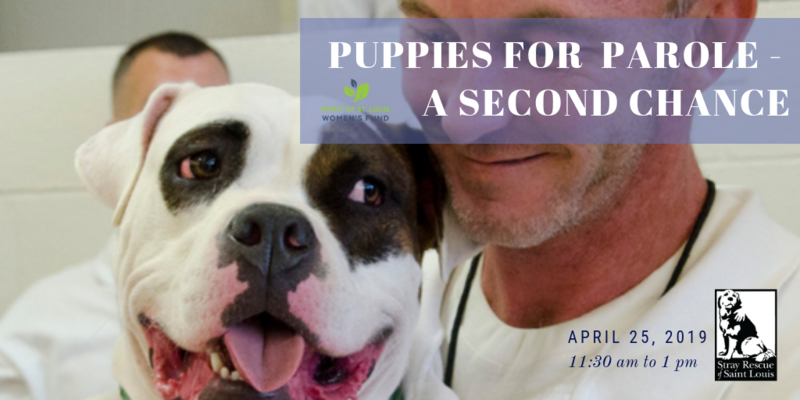 Join SOS sisters and friends to learn about Stray Rescue’s Puppies for Parole – A Second Chance. In the Puppies for Parole program, Stray Rescue dogs are paired with offenders at two medium-security prisons to learn basic obedience and socialization skills to increase their chances of being adopted at the end of each three-month program. Benefiting both the offenders and the dogs with which they are paired, Puppies for Parole allows for consistent socialization and training of rescued shelter dogs for them to earn their Canine Good Citizen certification. This program has the transformative impact of rekindling the spirits and lives of precious dogs, incarcerated men and released men in transition. Our speakers include Cassady Caldwell, executive director of Stray Rescue St. Louis; Shari Baney, Puppies for Parole trainer; and JR and Alex, two program graduates. Sponsored by the SOS Education Committee, this event will surely have an impact on all who attend! Box lunches and beverages will be provided; please pay the $10 fee online with your credit card or Paypal so we can order a lunch for you. Street parking is available on Pine Street.